Rega unveils new P1 Plus turntable with built-in phono stage | What Hi-Fi? Due out in April, the P1 Plus is a Planar 1 deck equipped with a moving magnet phono stage - all for £328. 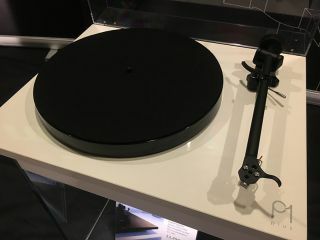 Rega's celebrated range of turntables have so far always been decks-only, without a phono stage built in, but with the popularity and success of decks such as the Audio Technica AT-LP5 and Sony PS-HX500, it was only a matter of time before Rega made its own plug-and-play version. Making its debut at the Bristol Show 2018, the P1 Plus is essentially a Planar 1 turntable with a moving magnet phono stage built in. The phono stage is based on the Award-winning Fono Mini A2D, except Rega has stripped out all the digital parts and upgraded the audio components for the new deck. Everything else is all Planar 1 - it uses the same platter, RB110 tonearm and plinth, which is available in gloss white or gloss black finishes. Rega says it's the most plug-and-play deck it's made yet, stating it takes as little as 30 seconds to get it set up and playing. The Rega P1 Plus will cost £328 and is due out in April, launching in the UK only at first.